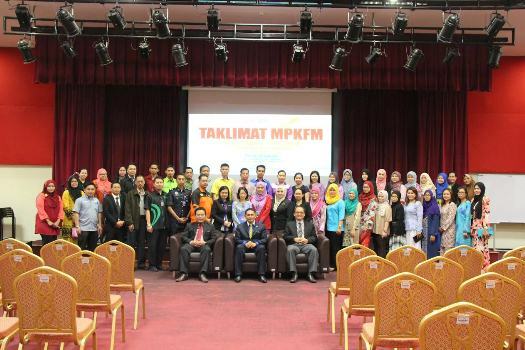 TUESDAY, 4 OCTOBER – The briefing on Work Procedure and Desk File (MPKFM) held for the first time recently involved 80 Records Officers and Non-academic Support Staff of Universiti Malaysia Sabah (UMS). Held at the Auditorium of the Centre for Postgraduate Studies (PPPS), the briefing was officiated by the Head of Governance Division, Registrar Department, Talib Abdullah Shani representing the Registrar of UMS, No’man Datuk Hj. Ahmad. Talib in speech said, the briefing was held to provide an opportunity for sharing of knowledge related to MPKFM for improvement and applicable to their respective Departments, Faculties, Institutes and Units (JFPIU). “The main focus of this briefing is to impart on participants the concept and standards used in MPKFM, this would facilitate documentation process guidelines of official duties of an organisation,” he said. Meanwhile, Head of Cluster, Hasmi Hashim when met said, the MPKFM cluster was one of five clusters created under JKIP UMS , aimed at strengthening governance at UMS. “It is in line with supporting UMS Strategic Plan 2013-2017, where one of the main objectives is to strengthen governance, leadership and delivery system in UMS. “As such, the organising of MPKFM is seen as a way of supporting and achieving its goal as planned,” he added.